Our Upwards soccer season started April 14th. It was Ben's last season to play. He really enjoys playing. He worked hard getting in shape. Then two minutes into week two something happened. Mariah had a birthday party and I was going to be a few minutes late for his game. I stopped to get her a lunch at Wendy's and had ordered the meal at the drive through. My phone rang as I waited. I saw it was Jeremy. I thought it was strange he was calling me then. After all, he was coaching Ben's game. I answered the phone and I heard Jeremy's voice saying, "Hold on, Jeanine!" I was a bit confused. Why was Jeremy, one of Ben's coaches, calling me after the game started? Then I heard, "We need to get him stabilized!" Can you imagine what was going through my head? I completely jumped out of the drive through waving as I drove past the window in apology. 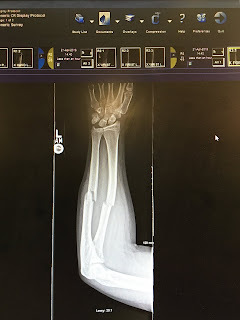 Jeremy finally came back on the phone and told me that Ben broke his arm and they were trying to get his arm stabilized. The 3 mile drive to the field is a blur. Once I got there I immediately followed Jeremy and kids to the local ER. Then I saw my boy as he stumbled out of the van. Oh my goodness!!!! My heart was a mess. My boy was clearly in shock and pain was obvious. We got him checked in and the day seemed to get worse, if that was possible. We saw a few nurses, a physician assistant, and radiology techs. There seemed to be a bit of confusion. We never saw a doctor. The IV line for pain meds was started but the meds barely lasted 30 minutes. He was miserable. Then his O2 sat dropped. He tends to do that with any sedation. After a few hours there, Jeremy left to go home and check on the five kids at home and gather stuff to spend the night. While he was home the Physicians Assistent came in and told me they were discharging him to go home. Telling us we could find an orthopedic surgeon the next week. There was absolutely no way I was going to allow that! I am not afraid to advocate for my kids. I demanded a transfer. We drove Ben to Morgantown's Ruby Memorial Hospital.....2 hours away. A couple of boys stayed home and we took the girls with us and met my parents in the parking lot of Ruby at 11pm. They took the girls back to PA with them for the night. The orthopedic surgeon and team were waiting for us. They could not believe our hospital was sending us home. We definitely made the right choice. Ben was taken into surgery by 9:00 the next morning, Sunday. They also had trouble with his O2 in the OR. 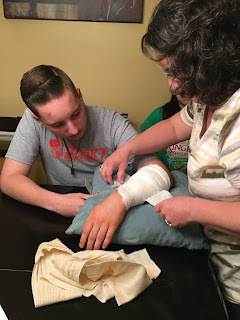 Jeremy and I have been through our share of surgeries with our kids. I am pretty sure we have close to 20 surgeries we have waited through. So when we had been up/awake for well over 30 hours.....I was happy to see Jeremy finally get a few minutes of rest while we waited during surgery. It was very short-lived. Next thing I know, I saw him pacing. After six previous surgeries for Ben, I knew that bedside manner does not determine the quality of a surgeon. So imagine my surprise when Dr. Tager looked at Jeremy and me before surgery and told us that his oldest son is just a tad younger than Ben. And since his kids are not at the hospital that he would treat Ben as "his boy" as long as he was back in surgery. He assured us Ben would be safe. And with his history of coding once under sedation...they were on their toes! 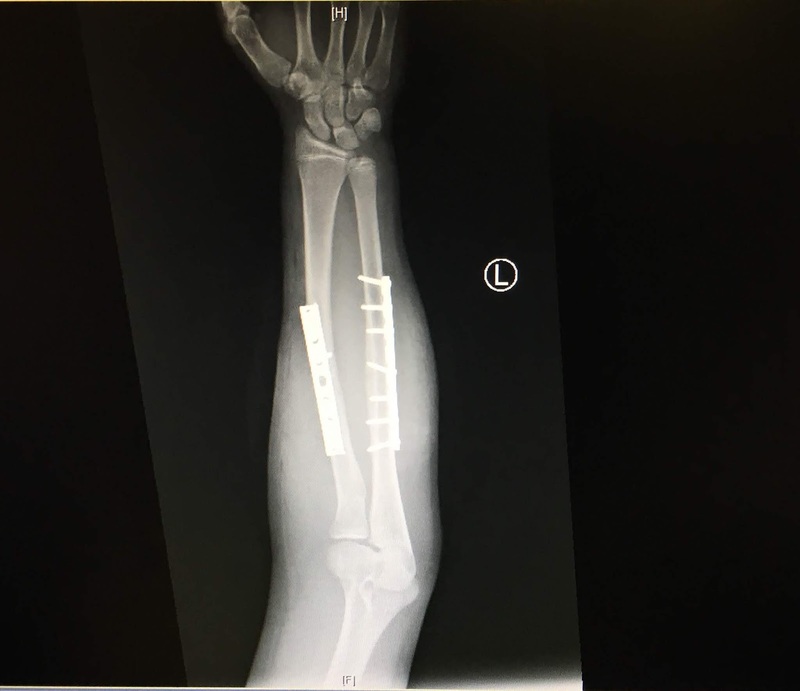 Two plates, 13 screws and no cast! We were discharged a few hours later. Mom and Dad made that trip back with our girls and I know they were exhausted. With no sleep and struggling with utter exhaustion.....we drove back home with Ben and our girls. Six weeks of lifting nothing at all......NOT A THING! Need I remind you that he is a 14 year old boy? A few days post-op we took the dressing off. That may have been more traumatic than prep for surgery! He was so afraid to lift his arm. Ben and Rebecca go to church early every week with Jeremy. 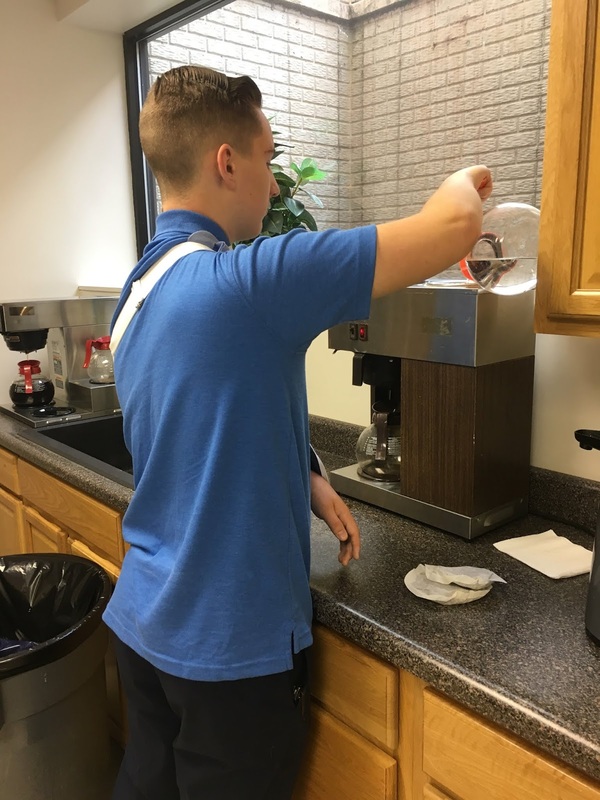 Seven days after a his surgery, Ben insisted on serving the coffee at our church, using one arm. Ben spent the remainder of the soccer season as an assistant coach (Dark brown shorts standing to the right of his dad). He was such a good sport about it but it killed him to just watch. Three long months, many miles walked in the neighborhood and many, many books later Ben was finally released to do anything! He could finally earn money cutting grass....not just feeding the neighbor's cat while she was on vacation. Ben's surgeon was one of the kindest men we have met. He is caring and sweet. That was such a bonus for us! Ben really is not a tall kid. His growth plates are closed so he is done growing (a little early but expected for him). Ben is 5' 8". We are happy he is such an easy kid. He takes it all as it comes. Honestly, Ben is probably the easiest kid for this to happen. I wonder if this could this possibly be the resurrection of my blog? I am a wife and mom who loves the Lord and strives to follow Him. We recently completed our second adoption of our sixth child......from China. We are surely blessed! December 13, 2013 QQ with Selah! December 17, 2013 Confirmed CA! December 27, 2013 Leave for China! December 30, 2013 Selah Day and Jeremy's b-day! December 31, 2013 Adoption Day! January 4, 2014 Selah's birthday! January 11, 2014 Arrive home! Dec 16, 2011	I800A approval granted!!! Dec 22, 2011	Filed LOI! January 4, 2012	Received our PA! May 22, 2012	Begin wait for TA! June 14,2012	Leave for China! June 18, 2012	Gotcha Day!! June 29, 2012	Back in the USA!! September 6, 2012 Readoption official!